Both principals, Lesley Adams and Mick Boddy, are Cardiff University accredited expert witnesses, Chartered Arboriculturists and Chartered Environmentalists. Mick is also a Registered Consultant of the Arboricultural Association. Jointly they have over fifty years’ experience within the arboricultural and forestry industries, encompassing periods of employment within the state, private, local authority and education sectors. With this breadth of experience comes the ability to address issues in an objective and pragmatic manner, resulting in a successful and cost-effective outcome for the client. Our business ethos is to maintain a personalised service, with all projects handled directly by one of the two principals. In this way we build lasting relationships with our clients enabling us to better understand their requirements and deliver these in a timely manner. 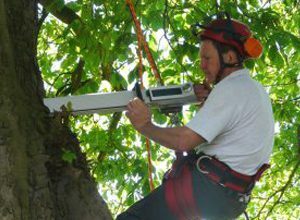 Lesley has over thirty years’ experience in the arboricultural industry and has worked at craft and professional level in both the public and private sectors. Following the completion of a National Diploma course at Merrist Wood Agricultural College, when she was awarded the prize as top student in the final year, Lesley worked during her early career as a local authority arborist and later provided arboricultural contracting services in the south of England. 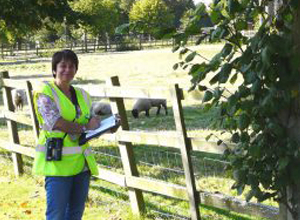 Subsequently, Lesley joined an arboricultural consultancy practice as a tree surveyor and continued to study for her professional qualifications. 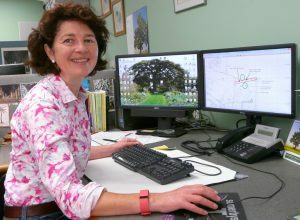 In 1990 she joined Cornwall Council’s planning department as arboricultural and forestry officer. Later that year she passed the Professional Diploma in Arboriculture. In the post at Cornwall Council, she advised three district authorities on tree related planning matters, including the administration and enforcement of tree preservation orders as well as tree-related development control matters. Additionally, she worked as an advisor on the care and management of the Council’s Highway and Education tree stock. An additional feature of the post was advising landowners on tree planting and aftercare, as an element of the administration of the Council’s free tree scheme. Lesley has worked as a private consultant since 1995 and is secretary of the Midlands Branch of the Arboricultural Association. She has been Vice Chair of the Examinations Board for the Institute of Chartered Foresters (ICF) since 2010 and is directly involved with the Institute’s professional examinations process, facilitating young professionals to promulgate to professional membership and the advancement of their careers. Lesley served as a member of the Institute’s Council between 2011 and 2014. She is a Fellow and Chartered Arboriculturist with the Institute, and also a Cardiff University accredited expert witness. During recent years, Lesley has worked on a number of projects involving scheduled ancient monuments and listed landscapes, advising on the management, protection and care of trees important for their cultural and historic context, particularly in relation to listed buildings and historic landscapes. With over thirty-five years’ experience in the forestry and arboricultural industries, Mick initially trained at Newton Rigg College in Cumbria and Merrist Wood College in Surrey. His experience encompasses periods of employment within the state, private & local authority sectors, including 5 years as Forestry and Arboricultural Officer with Leicestershire County Council, during which period he obtained the Master of Arboriculture qualification, prior to returning to the private sector to set up an Arboricultural Association approved contracting company. Mick has been a Registered Consultant of the Arboricultural Association since 1998, a Chartered Environmentalist since 2008 and a Chartered Arboriculturist since 2009. He specialises in the detailed assessment of high value specimen trees, particularly veterans, for key clients such as the National Trust. In March 2003 Mick was appointed as an arboricultural consultant inspecting officer by the Office of the Deputy Prime Minister to advise on tree preservation order appeals, the responsibility for which has subsequently been taken over by the Planning Inspectorate, for whom he is now a consultant inspector. Being a Cardiff University Accredited Expert Witness, Mick has acted as both a single and joint expert witness in civil proceedings, and an expert witness for local authorities in criminal proceedings. Having ridden in four Tour des Trees charity bike rides for the Tree Research and Education Endowment Fund – one in England and three in the USA and Canada – he is now a Trustee of the UK based Fund4Trees charity, which promotes sustainable treescapes and raises funding for tree research through sponsored bike rides and other events. Through his close and long-standing association with the renowned German scientist, Prof. Dr Claus Mattheck, Mick has been instrumental in the dissemination of research into biomechanics and the widespread adoption of the Visual Tree Assessment (VTA) methodology in the UK. Mick was the recipient of the 2012 Arboricultural Association annual award for his continued service to arboriculture.